Lots of bits-of-stuff in this post. Markets. I now have to make a few more decisions on which markets to attend. The new market I applied for. Rejected. But they have me on their waiting list, which in itself poses another problem. if they ring, it is likely to be within 24-48 hours of the market being on. Really short notice, and crunch time for decisions. I do understand, even though it is not good news. For most people, jewellery is lumped into one big pile. Regardless of what techniques and style you use, for the uninitiated, it all looks the same. Like scrap booking does to me. Although I have figured out some vague differences. I would like to know of it were my photos, the jewellery or if she even looked at my existing website. The letter, well, email, was a stock standard response, thanks but no thanks. None of the, we have 100 jewellery stalls and you didn’t make this round. That is partly what I want to know. Mum and I have decided that we will both go and check out the first market -which, surprise surprise, coincides with the first Woodbridge market – have a chat with the organisers and see what they have there. We’re going to do a tag team thing, by setting up the day before and then looking after the others’ shop while they are away. This way we can chat with the organiser and find out more. Websites. As you know I have my vista print one which while good, and I do love it, has a very non user friendly shopping cart. And it is not cheap, I am still paying for the extras even if I don’t use them. I have been looking around for something else and I think I’ve found it. For somewhat less than I am paying now I get a whole lot of things, plus a really cool shopping cart and check out system. As it is also a stand alone website I am not competing with a whole menagerie of other “shops” like you do on places like Etsy and Madeit. I’m just competing with the whole Internet… Hmm, the difference is what? exactly. I will be sharing the link once I’m done, and if you could please have a browse and ‘pretend’ to buy something (by all means, purchase something for real, I certainly won’t complain) and let me know how it feels and looks. Beading. I know I said that when I needed something to do I would reach into my UFO basket and make something. Well my mojo has gone further than that, add to that a little bit of feeling sorry for myself, and trying to work out a few a lot of things, I haven’t done much lately and probably won’t for a bit either. Blogs. Back to vista print, I started a blog there with my website and then came over to WordPress to play, (Nothing has changed since I’ve been at school, I’m still out on my own here). There are lots of blog posts about my craft and beading so while I get some things sorted out I will be ‘reblogging’ some of those posts here. Take note, that my writing style has changed a bit since then, so it will probably read differently to this. Thanks for coming along and I hope to be back soon with more creations. 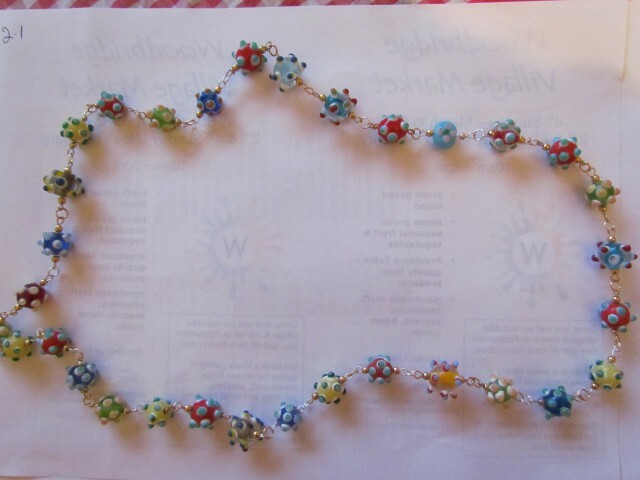 This entry was posted in Misc craft posts and tagged beading, blogs, craft, markets, sales, websites. Bookmark the permalink.